Grange Park Junior School now has an official website. Click on the school's logo to go there! WELCOME TO ALL FORMER STAFF, PARENTS AND PUPILS OF GRANGE PARK PRIMARY SCHOOL, HAYES, MIDDLESEX. Please use this site to get in touch with old classmates, and please send us info and pictures. The information can be emailed to our "Yahoogroup". 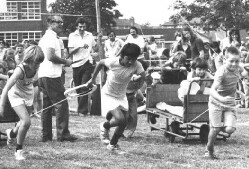 There are now more than 500 pictures in our Photo Albums, including pictures of the school as it is today. Dozens of memories have been added to our Message Board. Please tell others who went to Grange Park about this website. It will hopefully grow, but that depends largely on what people send us. It's for ALL ex-pupils, from the school's foundation onwards. Everything on this site applies to ex-teachers too! Back to school - 60 years on! 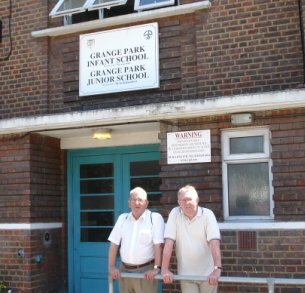 Click the photo of Ernie and Ken on the right to hear the experiences of two former Grange Park pals who visited the school in July 2006, six decades after leaving! The pic on the left shows 1st Year infants in the 1960s, from a display assembled by Claire Steward. See pix of her displays in our photo albums soon. In a hurry? Use this to post a quick comment. SO MUCH TO SEE AND READ! Use the buttons below to choose a section. There are more than 500 photographs and 700 memories and messages on the site so far. CLICK HERE for HillingdonChat.com - where Hillingdon meets on the net! This is one of HUNDREDS of pictures which you can see in our photo albums. Do you know what the event was, or the year? Or do you know anyone in the picture (there's a chap that looks just like Kip Bennett, former minister of Hayes Methodist Church...is it him?) Answers please in our Memories section...asap! These flowers for the first one of my brilliant teachers to get in touch! Did you teach the GPEX files webmaster, Jonathan Hayles? If so, get in touch.... and I'll get Interflora to send you the flowers in this picture! There's a complete list of my teachers on "Notices". If anyone else wants to offer their teachers a similar thankyou, feel free to use the Notices section to do so. If you didn't teach me, but remember me (dinner ladies, welfare ladies....) still get in touch and I'll send you some flowers too! PS I liked ALL my teachers, so you're quite safe! Do you want to receive important information about any future reunions or other events to which you may be invited? The mailing list simply enables us to let you know when there are major updates to this site. Your email address will be passed on to no-one else. Do you want to know when there are major updates to this website? THEN PLEASE ADD YOUR NAME TO THE MAILING LIST - It is used for no other purpose!